The Suzuki corporation was established by Michio Suzuki in Japan in 1909. It started out as the Suzuki Loom Works company. Suzuki builds wagons, sedans and SUVs, and is renowned for its affordably priced automobiles. By the time the 50s rolled around, the company had expanded its product line from looms to automobiles. The Suzulight was introduced in 1955. It offered Japanese car buyers a lightweight, compact car. In the early 60s Suzuki built its first truck. The Suzulight Carry also had a light frame. By the late 60s Suzuki was also producing the Fronte, the Fronte 800 and the Carry Van. The Jimmy SUV came out in 1970 with a four wheel drive system. Later in the 70s the Alto and the LJ80 were launched. Suzuki joined with General Motors in the 80s and began selling its automobiles under the GM brand in America. By the mid 1980s the Suzuki brand was added to its exports to the United States. The Samurai SUV was an instant hit and could be purchased with a hardtop or a convertible top. In the late 80s the Samurai was rated as unsafe by a popular consumer magazine leading to poor publicity for the Suzuki company. The Samurai sales dropped significantly. By the 90s the Suzuki name had regained its strength. The company had produced over ten million vehicles that included the Sidekick, the Cappucino, the Wagon R, the Esteem, the Vitara, the Grand Vitara, and the X-90, and the Swift. The product exports had also grown to include Vietnam, Egypt and Hungary. In 2004, Daewoo was bought by the Suzuki and General Motors corporations. The Suzuki brand was given to two of the Daewoo models, resulting in the introduction of the Suzuki Verona and Forenza. Today Suzuki offers the Equator truck, the Kizashi sedan, the SX4 and the Grand Vitara. The Equator features several body, cab and styles. It comes standard with bucket seating, steel wheels and storage under the rear seating area. The Kizashi gets four trim options along with steel wheels, remote entry and start, fabric upholstery, twin region climate control, full power components, speed control, seven speakers, and USB and iPod connectivity. The SX4 compact car can be purchased as a hatchback or a sedan with a choice of four trims. It offers full power components, steel wheels, a trip computer, and an adjustable driver seat. The Grand Vitara SUV provides four trims and steel wheels, remote entry, automatic air management, comprehensive power components, a trip computer, navigation technology, a CD player and four speakers. 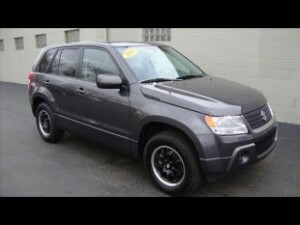 Carson Cars has a great selection of the best Suzuki for sale in Lynnwood. Call us at 425-697-6969 or stop by today.